This entry was posted in Pic of the Day, Totally random and tagged Saugatuck Avenue. Bookmark the permalink. YES! Every morning and afternoon I see this for over a week! Just keep the towel she obviously doesn’t want it. Go to Bed Bath and Beyond! WHOLE BUNCH OF TOWELS, an entire aisle! When I see this sign every morning I like to think it is the beginning of a classic love story. A guy meets the love of his life (Christy) at Compo Beach. 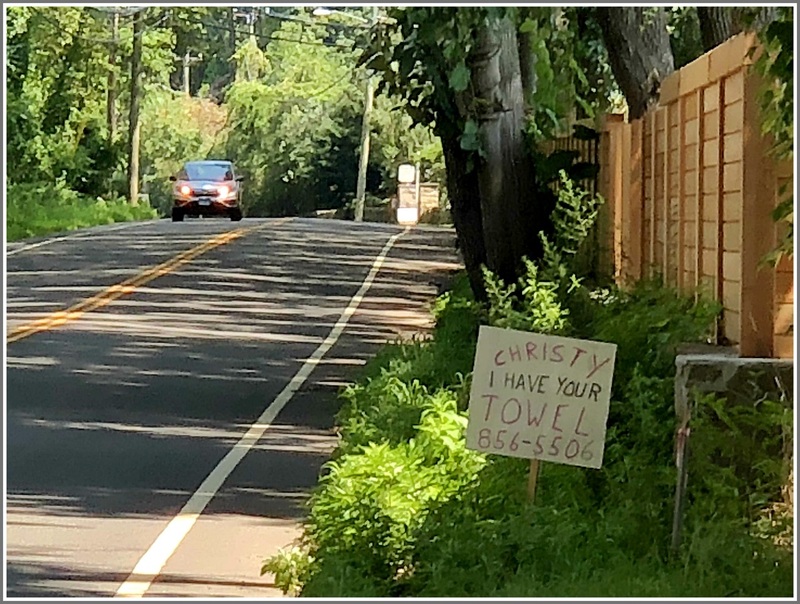 They engage in a few blissful moments of love at first sight, only to have Christy’s friends yell at her to join them in their car as they are leaving in a hurry. She reluctantly darts off to join her friends, but leaves her towel behind. This poor guy is desperately trying to find the woman of his dreams and this towel is all he has! So I don’t mind seeing that sign, makes me cheer for the guy.